When you want to be mean and green and steal Christmas, you need a Grinch costume pattern. Unfortunately, the standard pattern makers don't offer this furry costume as one of their line. But don't let that stop you from making your own Grinch costume - not only can you do it, you don't have to be a sewing professional to do a great job. If you sew, you may be surprised to learn that McCalls, Simplicity and the like do not offer a Grinch pattern, particularly since they offer animal patterns that require working with fur, which as you may know is not easy. Furthermore, the Grinch is a popular Broadway character come the Christmas season, so clearly someone is making the costume. Possibly it's that a version of the costume can be bought in shops and online, or it may be to do with licensing, but if you are looking for a specific pattern for sewing, you're out of luck. The good news is that many crafty types have figured out a way around the problem, building their own Grinch costumes at home and then writing about it online so that anyone with some time and energy can try their luck copying the results. If you are making the costume for a child, this can be a preferable way to go, because a craft project using fun things like glue and construction paper can involve and entertain your child in a way that a sewing project often does not. If you want a quick and easy Grinch costume pattern that only requires gathering the materials and then a bit of work putting them together, go to Family Education, which has a pattern that they say takes about 30 minutes to create. The only fur involved is white fur trim for the Santa hat and jacket - the Grinch green comes from a turtleneck, gloves, sweat pants or tights and face paint. You can make your own Santa jacket with an old red sweatshirt or jacket (older is better, because it should look worn - great excuse to hit a thrift shop and save more money on the costume) and faux fur, which is easy to get at any fabric shop. For a step-by-step, no-sew guide with detailed pictures for making your Grinch jacket, go to Blue Pencil Pro. Stay there if you're looking to make a seriously elaborate costume with green fur. This is one of the best, clearest and most easy to follow patterns around. And if you're the least bit crafty, it will be even more of a breeze. Your biggest challenge might be in finding the requisite green fur. A large fabric shop, or one that specializes in theatrical fabrics, should be able to help you. If they don't carry the fur themselves, they will probably be willing to do a special order, or direct you to a web site from which you can order yourself. You can also try posting a request on eBay or Craig's List - people sometimes have costume fabric they are looking to sell. If nothing is quite working for you and you still want to be the Grinch, you might try looking for second-hand costumes. 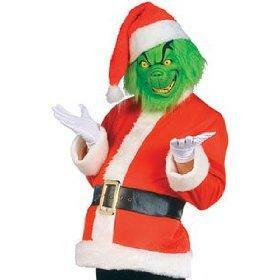 The standard Grinch costume available at Amazon and other online shops is very good, and is often on sale on eBay and other auction sites. Even if you only find the mask, you can then create the rest of the costume with ease using any of the above advice. Finally, add some fun by looking for a stuffed Max to carry with you!